Found this message on our Facebook Fan Page (Sam’s been around for 10+ years, I’ve been around for less than 2 and I’ve already got more followers on Facebook than he has, what a shame!). Begins a sentence by insulting an individual he does not know. Insults a person’s beliefs because he disagrees. Believes that Sam Shamoun has not, and never will be wrong – deifying him to a great degree! Repeats calling names and insults. Challenges me to debate Sam Shamoun. Calls me names once more. Hi there Loius! Unlike you or Sam, I don’t need to insult your Prophets or mock your beliefs when I communicate with members of other faiths. I’m not sure where you learned your decorum, but it seems you’ve taken on some of Sam’s attributes and mannerisms. In the adult world, we don’t call people names, we don’t curse or insult their beliefs because we disagree – there is something called respect, something that both irreligious and religious persons abide by. Secondly, Sam Shamoun will not debate me, he cannot debate me because he is afraid of me. I’ve sent him numerous challenges and he’s always responded by insulting me and ignoring the challenge. So while I’m not afraid to confront Shamoun, he’s very wary and afraid of me. If you don’t believe this, you can ask Shamoun to take an oath by God (see Psalm 63:11) and let him show you the numerous email challenges I’ve sent him. You need to ask why he runs from Muslim challenges, especially my own. Thirdly, Sam has been refuted by many persons, in fact, he’s been solidly debunked by me many times, I even have an entire section dedicated to responding to him. 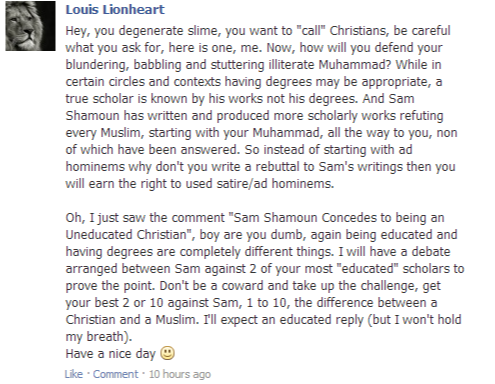 He is very easy to refute and I’m being quite honest when I say that no educated Muslim takes Sam seriously, in fact, his articles are sometimes used in some circles to teach children just how awfully he misrepresents Islam – if children can learn what Islam isn’t from Sam’s articles, it goes to show you that he is of very little worth. Lastly, I will gladly take up your challenge, unfortunately, Sam will not endorse it. He will not debate me, because he knows that he cannot, hence why he is unable to respond to any of my articles refuting his writings.